This dresser was a happy thrift store find for me – I love the Mid Century Modern look since I was a kid and have incorporated quite a bit of it into my home. This actually matches a nightstand we have that we found in North Carolina, however it was in rougher shape and needed some updating. So, I broke out my trusty spray paint and lo and behold, there is that red again from the previous post onthe nursery, Paper Airplane Mobile, I told you it was a theme in this room! Eric is such a good sport – I can’t tell you how often he gets a text from me when I am in a second hand store that goes something like this, “This would work perfectly in _________ (insert room name here), don’t you think?” It always is accompanied by a photo. This just happens to be one of those photos. 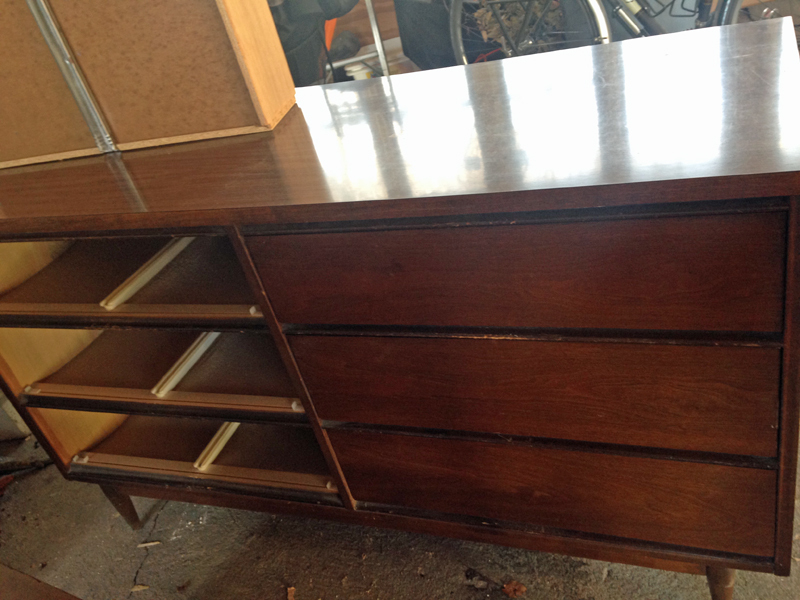 I think I scored this dresser for $20. When I got it home it sat in the garage for a while (surprised? I’m not!). 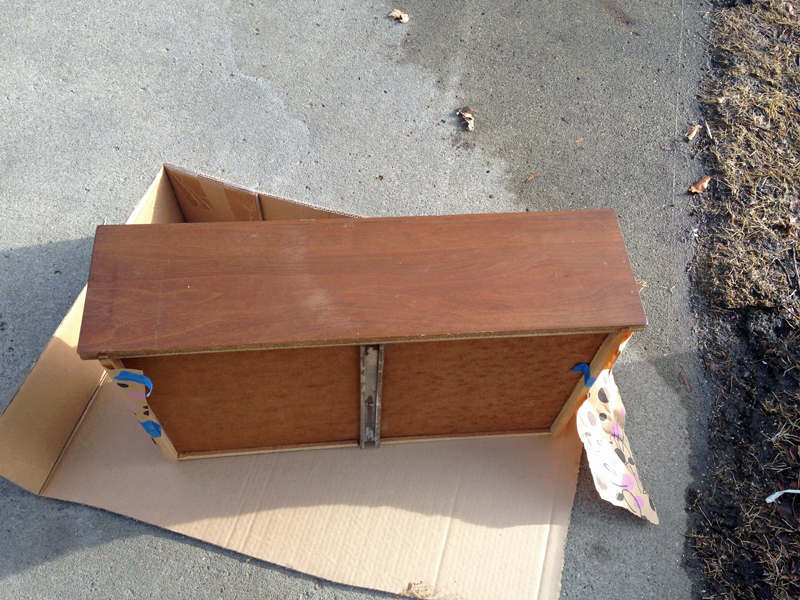 Then, I cleaned it up, took out all the drawers, and sanded each one to remove the top layers of beat up finish. Next, I taped the sides of the drawer with paper, to protect the edges. 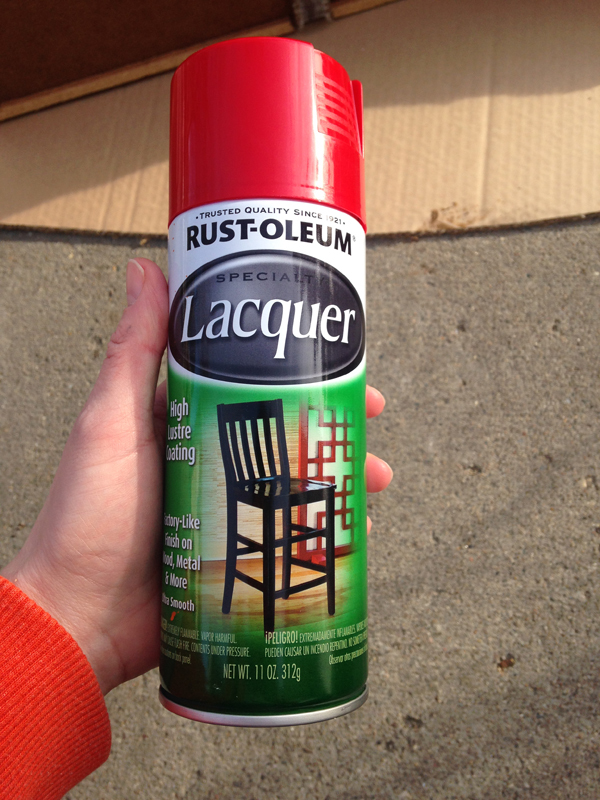 Though in hindsight, this was not necessary as I was neat and tidy and did not spray red everywhere. 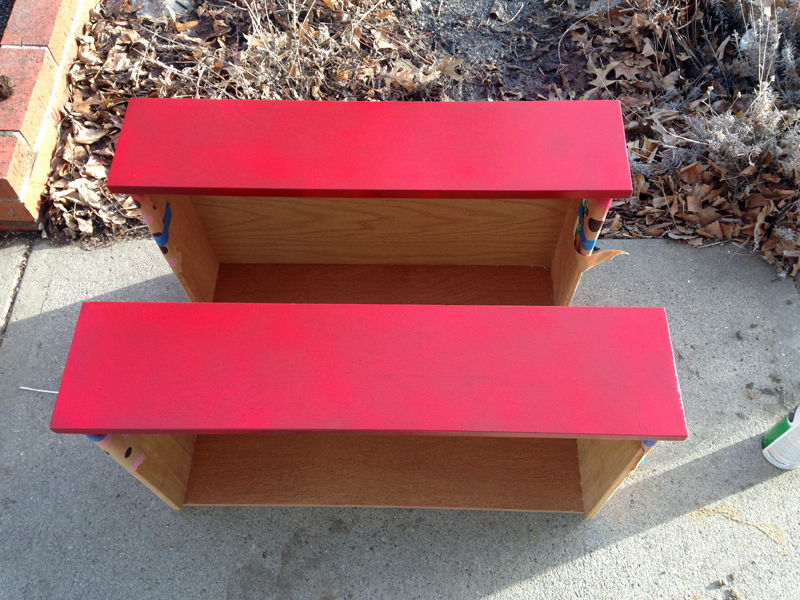 To paint 6 drawers I ended up going through 2 or 3 cans of this bright red lacquer spray paint . It left a nice smooth and durable finish that is perfect for furniture. After several coats and some drying time, my dresser was ready to assemble and moved into the nursery. It now houses diapers, baby clothing, and a changing table attached to the top. 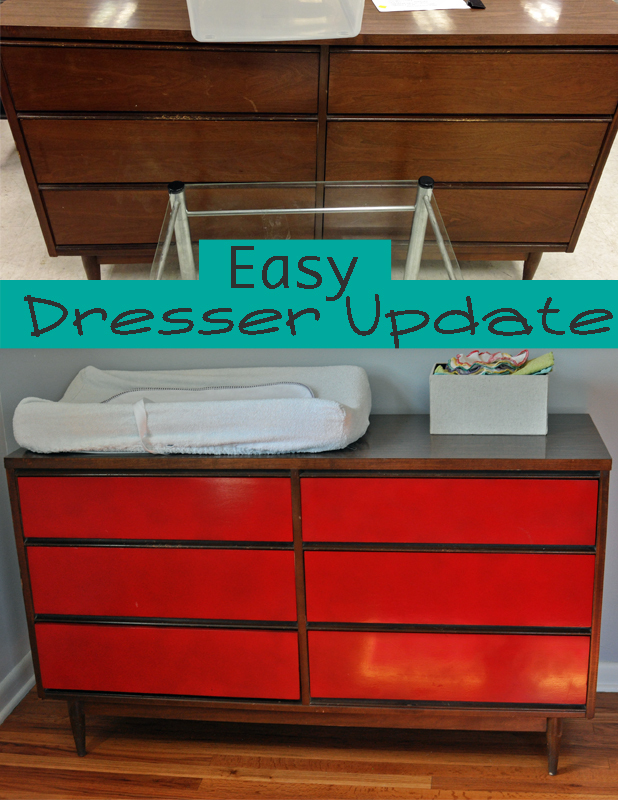 This dresser is so stylish that I may steal it back from my son at some point in the future! 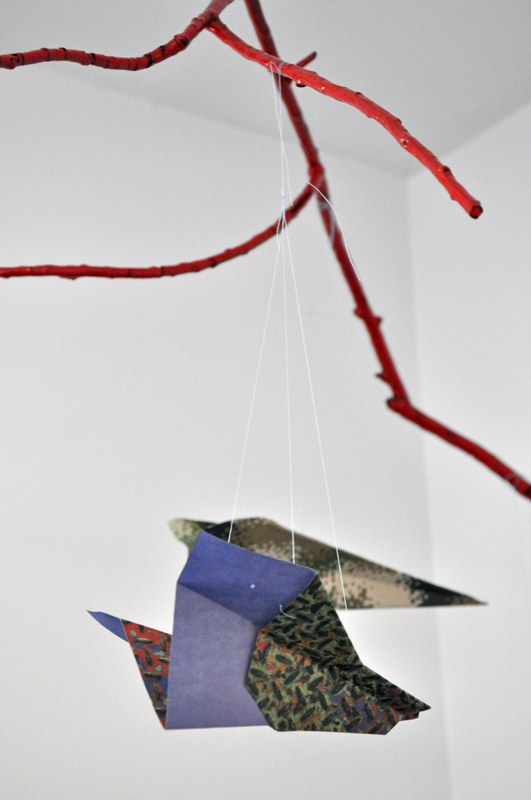 This nifty and very easy to make mobile is now hanging in a corner of the our completed nursery. 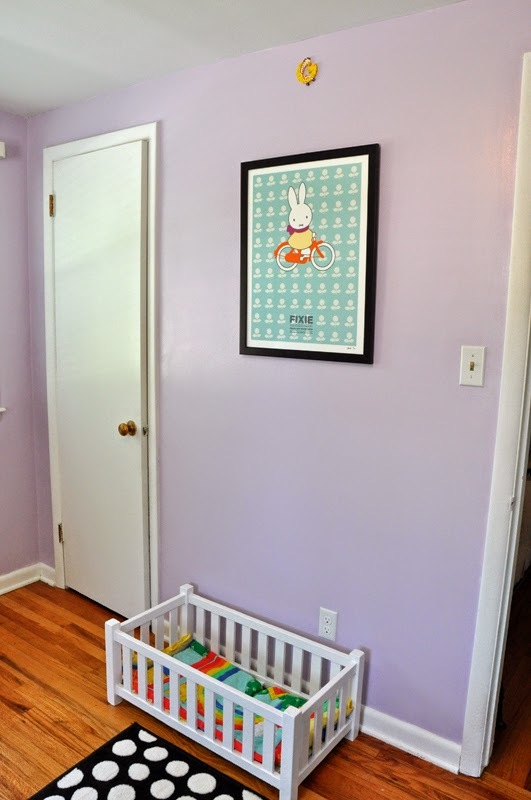 Hooray for a finished and lovely space for baby! I will give you a tour of the rest of his room in due time. To make this mobile I simply found an interesting stick from our yard and cleaned it up a little. I trimmed the ends to shape it, and then wiped it off in preparation for painting. 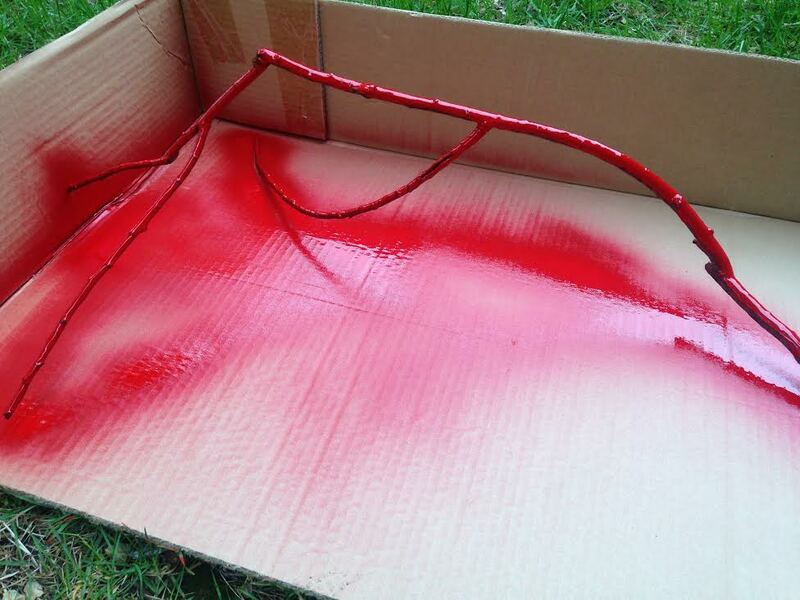 I used a high gloss red spray paint to cover the entire stick – this color is a theme throughout his room. There are some interesting areas of black that poke through from underneath the red due to the texture of the bark. 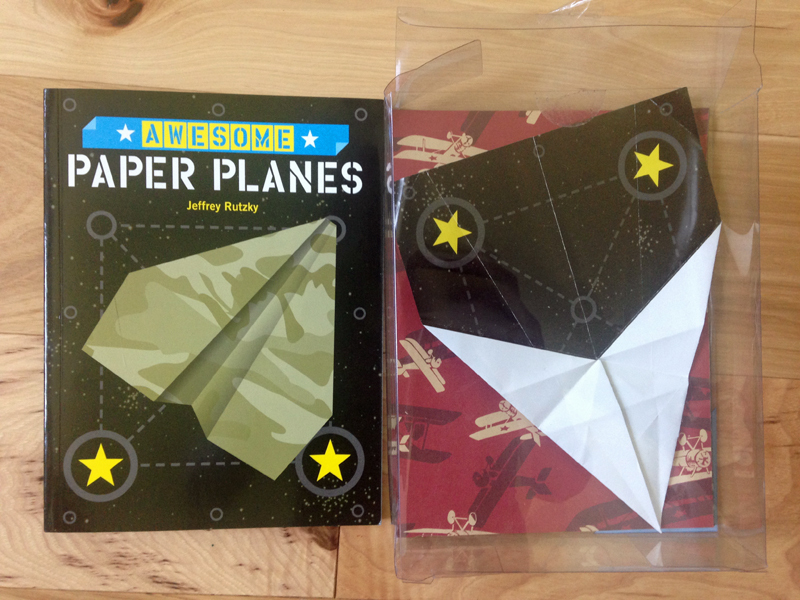 Then, with the help of Eric and this fun (er, challenging) book, Awesome Paper Planes , we made a few paper airplanes. By we, I mean Eric. I have always struggled with origami and anything that involves precision folding and following step-by-step directions. My cranes always turn out mangled and sloppy. I always feel bad about this lack of skill, because every year I have a student who is dying to try origami and I have yet to master the most basic projects. 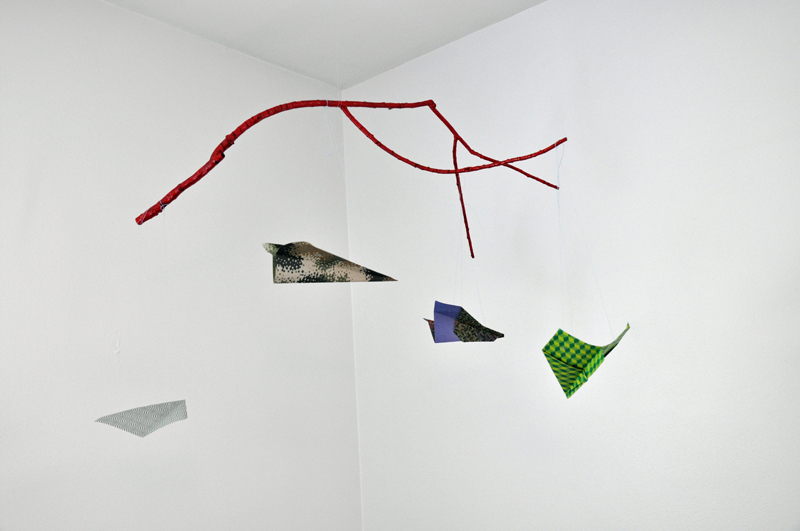 To assemble the mobile, we hung the branch from a small hook installed in the ceiling. Then, I hand sewed three lengths of thread through each airplane. These three pieces of thread create a triangular shape – think like the stability of three legs of a stool. The three strands help each airplane hang like it is flying. Each airplane was then tied on to the branch. It is soothing to watch the mobile spin slowly in a breeze and look forward to rocking my son under it. A looming due date creates all sorts of projects for me – cleaning, organizing, packing hospital bags, readying the baby room, and even baking pies. Actually, it was not a looming due date that caused me to bake these two pies, but the return of family from out of town. Eric’s sister and her family just arrived in town to become residents of the Des Moines area, so these were welcome back pies. 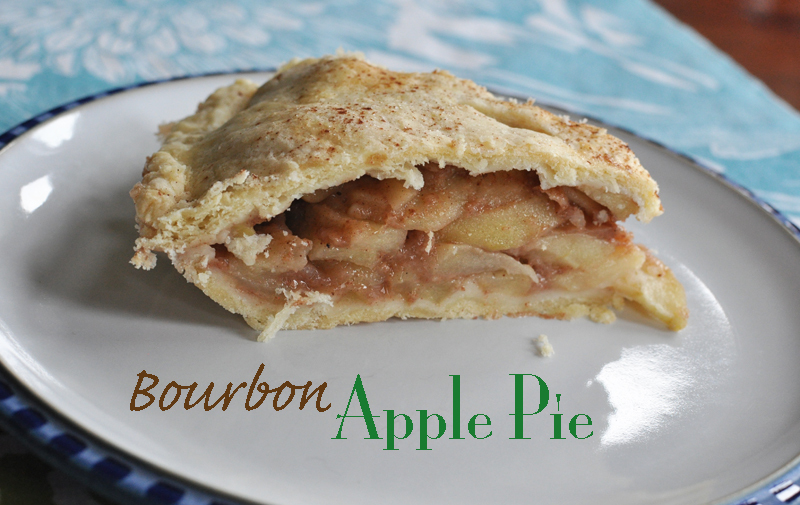 I did try something slightly different with my tried and true apple pie recipe though – the addition of bourbon and brown sugar in the filling. See below for the recipe. 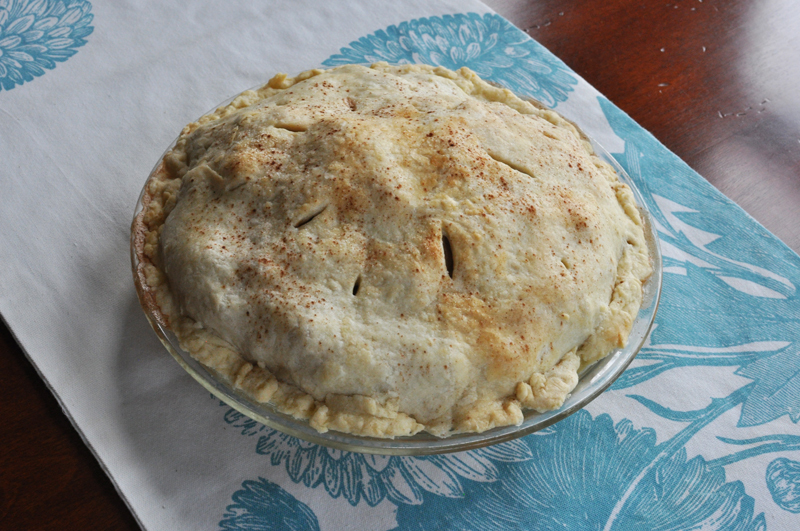 The second pie was a strawberry rhubarb pie – one of my all time favorite flavor combinations. 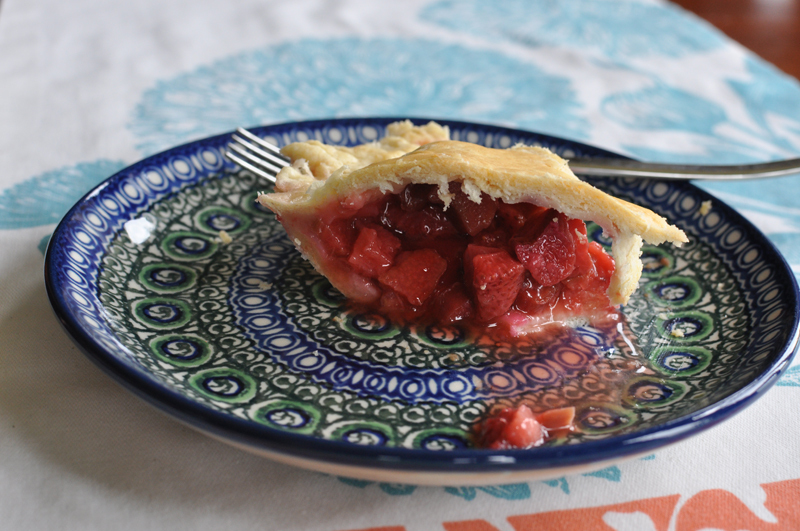 The strawberries do an excellent job mellowing out the tart rhubarb. I am ever so grateful to be able to buy reasonably priced and high quality fresh rhubarb now that we are back in Iowa. The only way to actually get decent rhubarb in North Carolina was to buy it frozen. 1. Preheat oven to 400°. In a medium mixing bowl, use a pastry blender to cut in cold butter until pieces are coarse crumb size. 2. Sprinkle 1 tablespoon ice cold liquid at a time; gently toss with fork. Push moistened dough to side of bowl. Repeat using rest of liquid. Dough will be dry, do NOT give into temptation to make dough moister by adding more liquid. This will make your dough tough. Divide dough in half; form into a ball. 3. On a lightly floured surface, use your hands to flatten ball of dough. Roll dough from center to edges into a circle 12 inches in diameter. Do not overwork the dough and do not allow dough to warm up. Refrigerate while preparing filling. 4. Carefully transfer dough to pie pan, by wrapping around a rolling pin, not allowing it to stretch. 5. Transfer filling into pie pan. Repeat step 3 and 4 for second ball of dough. Gently drape second circle of dough over the filling. Use your fingers to seal the edges of the dough. 6. Optional: brush dough with milk and sprinkle with cinnamon and sugar. Cover edges in foil. Place piece of foil on bottom rack of oven. Place pie in preheated oven, on middle shelf. Bake for 20-25 minutes at 400°. Reduce oven to 350°, remove foil, and bake another 35-45 minutes longer or till crust is golden and filling is bubbling. 7. Let cool on wire rack. 1. Peel and slice 3 lbs of tart apples. Place in large mixing bowl. Add lemon juice, brown sugar, flour, cinnamon, and bourbon. Mix well and allow to stand for 10 minutes. I can’t believe is has been a year since we moved to Des Moines from Greensboro. What a year it has been too! Things are finally beginning to settle for us as a family. It is also beginning to really feel like we live in this house as the rooms come together one by one. I hope to share a few more of these projects before baby #2 arrives. 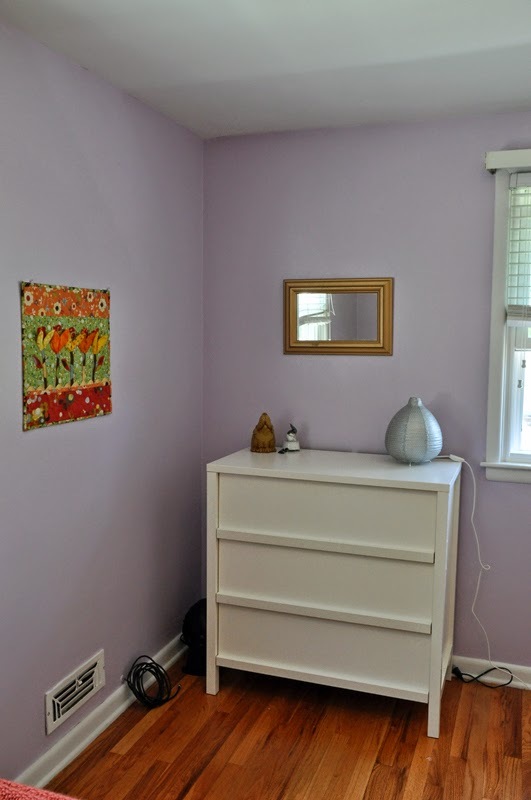 First up is the new big girl room, AKA the purple room, according to my almost three year old. It was only recently that my daughter’s big girl room was ready for her to move in. 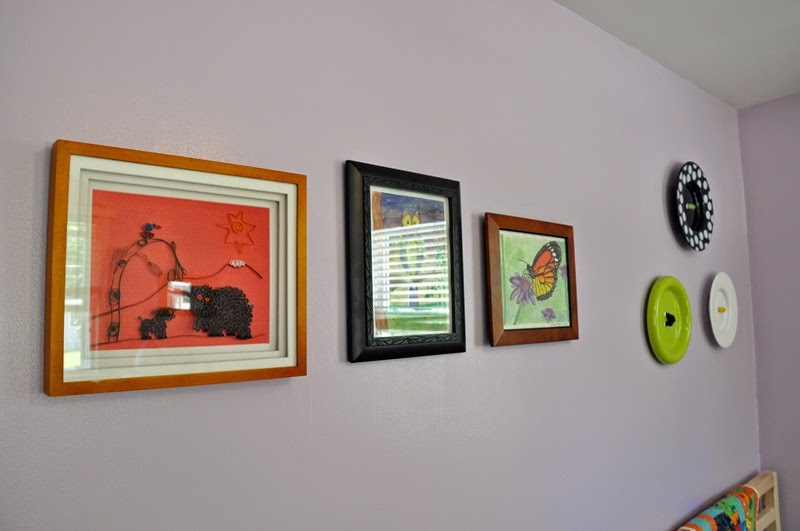 She had been in another bedroom, but that room is to become the nursery for baby #2. My toddler loves yellow and purple. We already used a lovely pale shade of yellow, Pastel yellow, in the playroom. I opted for her other color of choice, purple, but in a pastel shade. 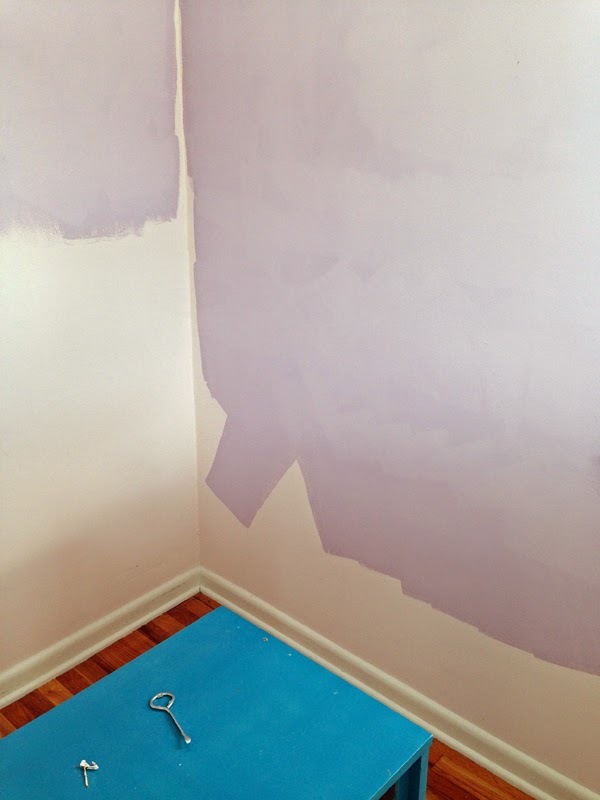 I am not usually one to go for pastels, especially lavender, but this color is just wow on the walls! Greta picked out that artwork at the recent Des Moines Pedal Art Show. The doll crib was one that my sister and I played with when we were little girls. The original color of this room was an odd, faded rosy pink color. I was happy to see it updated and made more striking. Eric painted this room while I was in Minneapolis for my sister’s baby shower and enlisted the help of a friend. I was truly worried that he would freak out about the color and stop part way through. I was happy to receive text messages with updates on how much he liked the color. When I discovered that Pantone interior paint was available at Lowe’s, I knew our entire house would be done in these lovely colors. We found perfect shades for almost every room of this house. I still have yet to paint the upstairs bathroom and decide on a color. 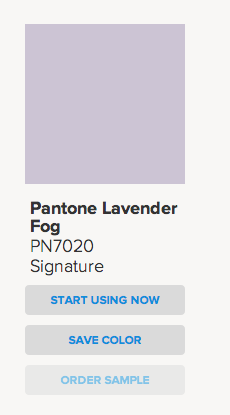 Pantone is pretty fantastic – you can find a wide array of Pantone items out there! helps her organize books and stuffed animals. The playroom also helps us to keep her room free of clutter, which I always am thankful for when I have to make a trip into her room in the dark. The dresser and silver lamp are also Ikea. Her gold framed mirror was a thrift store find and the quilt was a gift from a friend when she was born. I’m still feeling so grateful that the floors in our upstairs were in as good of condition as they are. The butterfly and owl watercolors work well with the violet fog color. My mom made Greta the elephant artwork (left) with a technique called quilling. 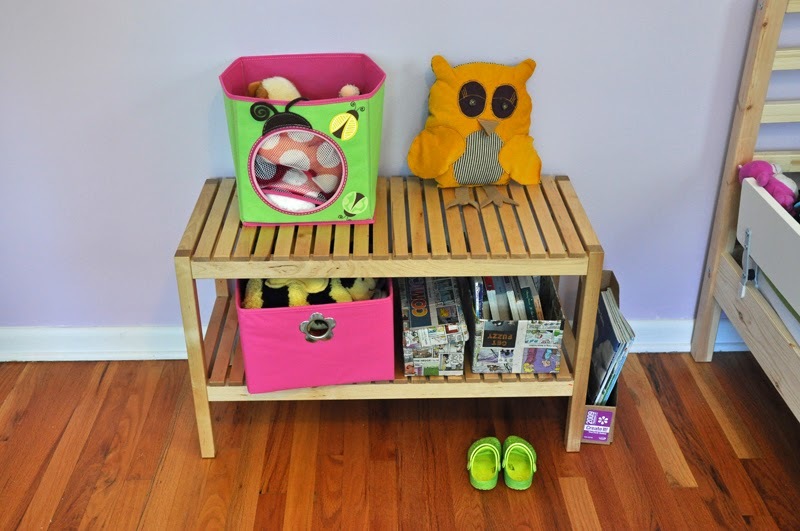 Her collection of favorite stuffed animals, doll clothing, and favorite bedtime books are all housed in bins and crates on this bench. It can also double as a nightstand when she eventually understands that concept. I have to admit, I had a small heart attack in the storage bin aisle at the store recently. I have been trying to find ways to wrangle in all of my daughter’s things in her room and playroom. Bins and tubs just make sense – she is already to trained to put items away at school based on the photo on the end of the bin. 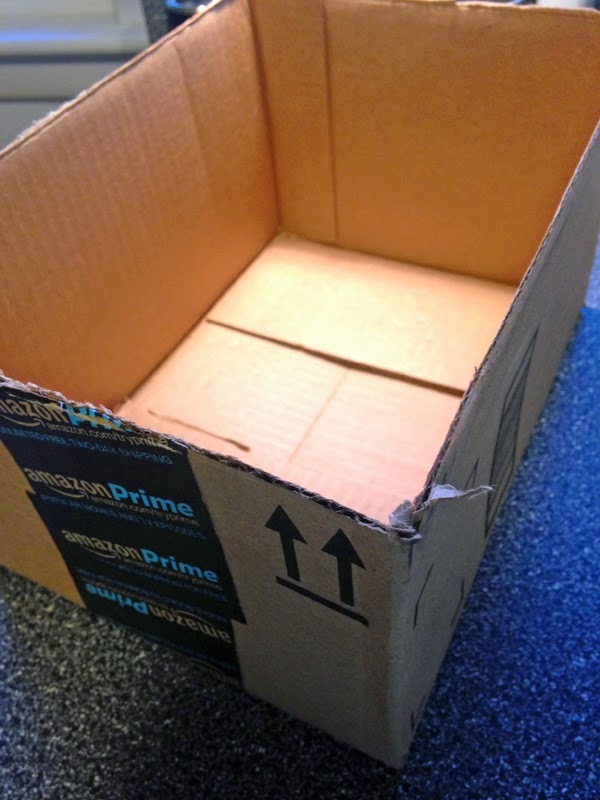 Yet, I am always amazed at how much a cheaply made box from India or the Philippines really is. So I decided to make my own (it’s a disease you know, thinking you can make everything you see). I was happy with the final products, seen above in my daughter’s room. 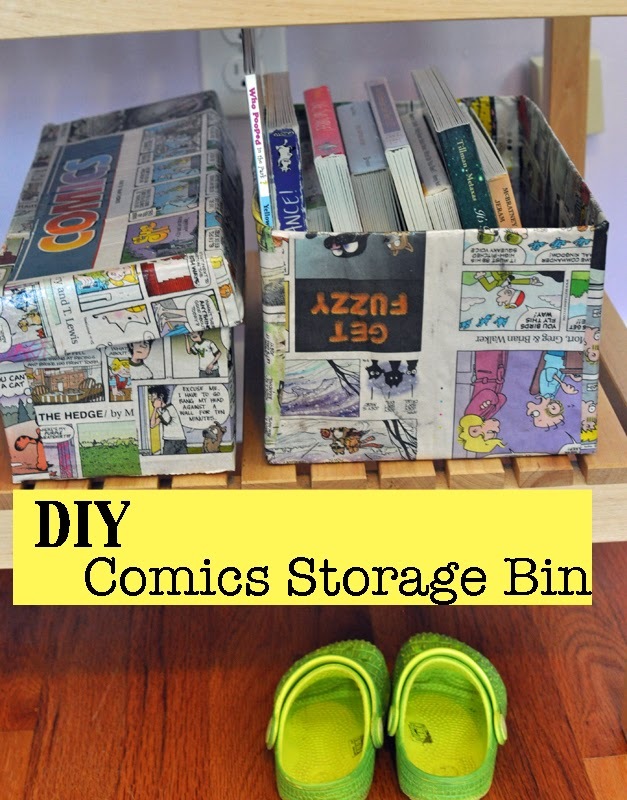 Read on for the easy DIY steps. 2. Cut box to desired size. For my first box, I cut the top flaps off. For my second box, I decided to try leaving the shoe box flap on. 3. Cut size of paper you plan on gluing down first. 4. 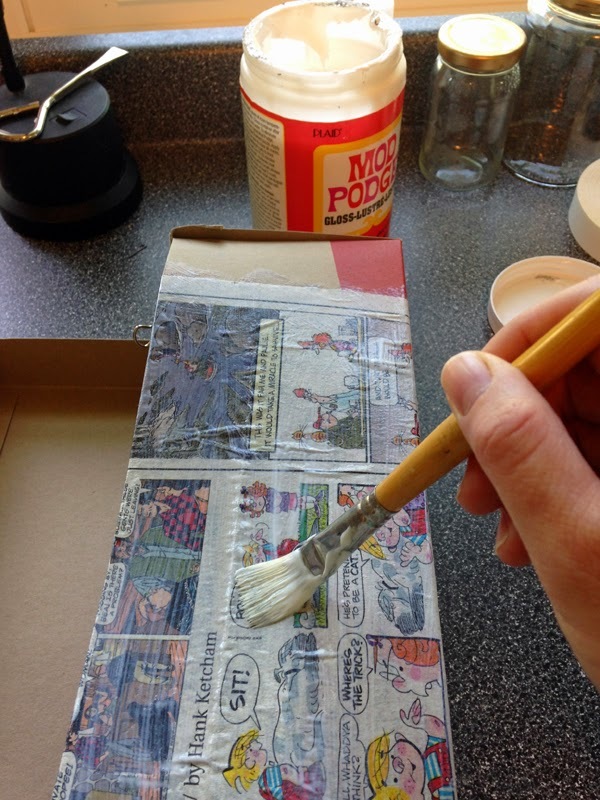 Brush Mod Podge over the area you are planning on covering first (about the size of the paper you just cut). I worked on one side at a time so that the Mod Podge would not glue too quickly. That paperclip, seen above, is holding a flap down, since one side was coming loose. 4. Carefully smooth cut paper over the entire area of Mod Podge. Smooth with hands and whenever possible, wrap edges with at least 1/2 inch of paper to prevent curling and rough edges later. 5. Brush a layer of Mod Podge over paper. Use smooth brush strokes and use just enough to cover the paper. Thick brush strokes will dry with ridges and texture (unless that is the look you are going for). Allow 15-20 minutes and then add a second coat. Allow to dry completely before using. 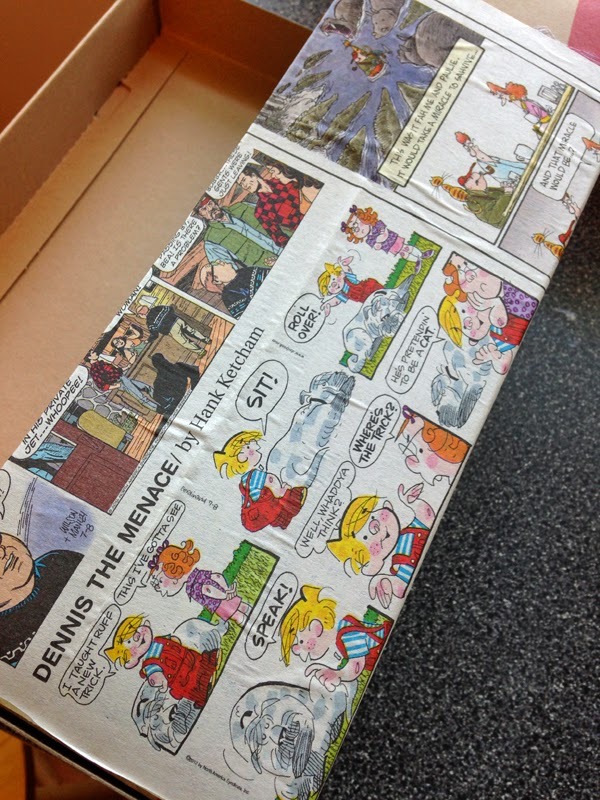 Due to the nature of newspaper, the finished product will have some wrinkles and bubbles. Embrace it. 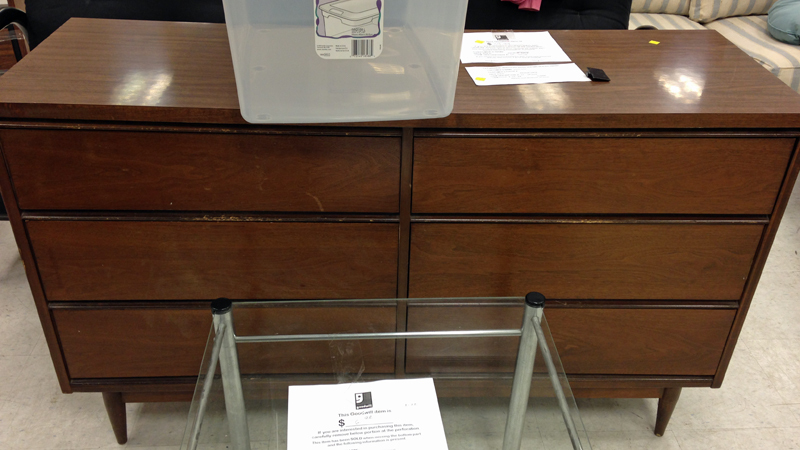 The open box, right, is much easier to use than the box with a lid, left. 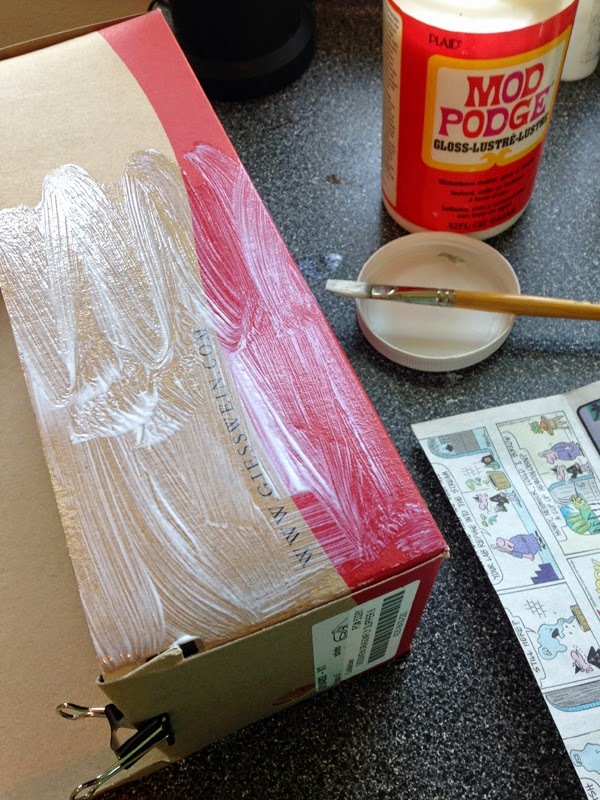 Boxes with lids tend to stick together a bit due to Mod Podge’s slightly tacky finish. 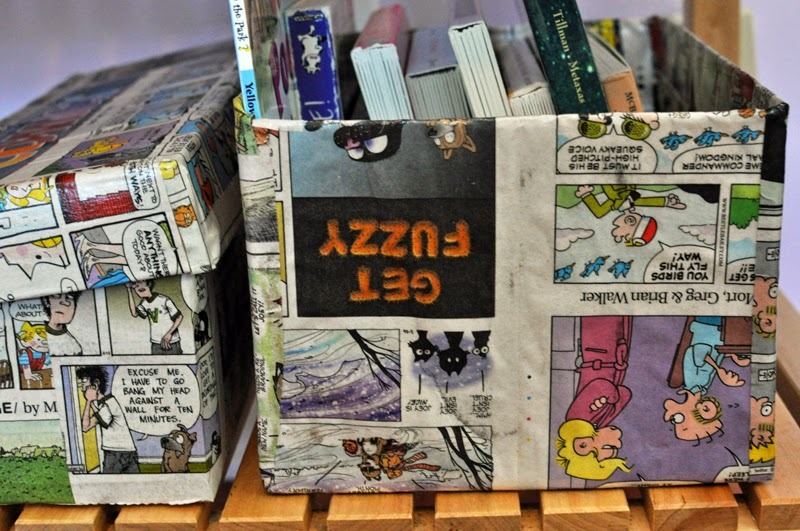 The finished product was a hit with my toddler – she loves to read the comics, or coupons as she calls them. Who knows why? They are now being used to corral her favorite bedtime books and doll clothing in her room. More on her finished big girl room later. Greta and I have both been busy working on collages lately. Greta has watched me make collages countless times and I haven’t yet thought to have her make her own at home. I know she’s made them at school, but she blew me away with her collage skills. Little collage artist in training, I tell ya! This particular collage was my favorite one that she made yesterday. It was the third one in a series of four that we completed in the morning before nap time. She was tickled at the way the holes would allow colors beneath to show through. She quickly learned that the glue had to go on the edges and so had to slide her papers around in order to move the glue. The large glue bottle was perfect for her little hands. 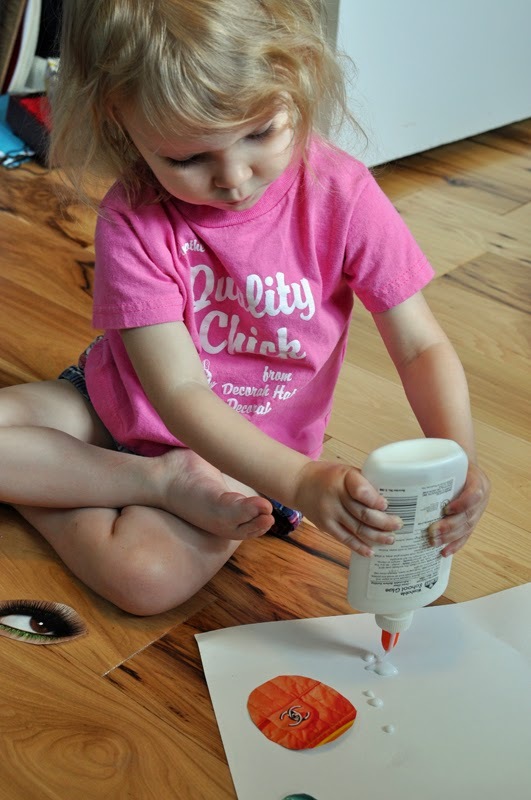 We practiced squeezing the glue out onto the paper while the bottle was just above the paper. She enjoyed slowly squeezing out the glue and watching it pool, as it was pooling she would ask me, “Good, Mommy?” to check on the amount of her glue. Only a couple times did I say, “Ok that’s good,” most of the time she figured out the amount of glue on her own. 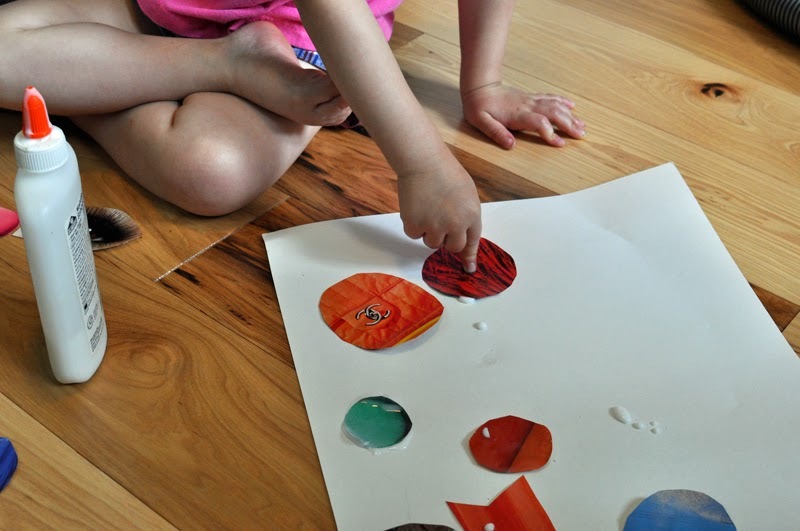 Next, Greta placed her cut papers onto the glue dots. I enjoyed watching her choose papers based on color, size, and shape. I used the color issue of In Style magazine for all of her shapes. Fashion magazines make the best collage magazines due to their textures, variety of color, and size of colors. 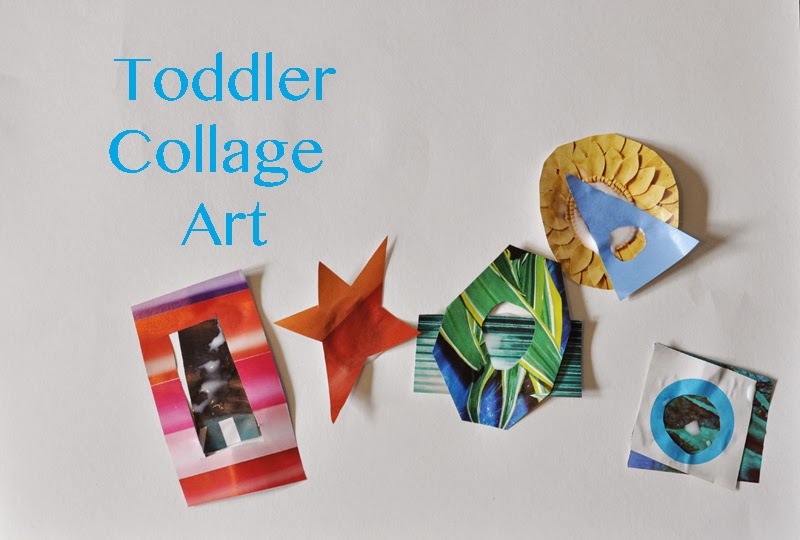 The first collage she made was full of random shapes. For her second one, she decided she wanted mostly circles. This is her mostly circle collage. 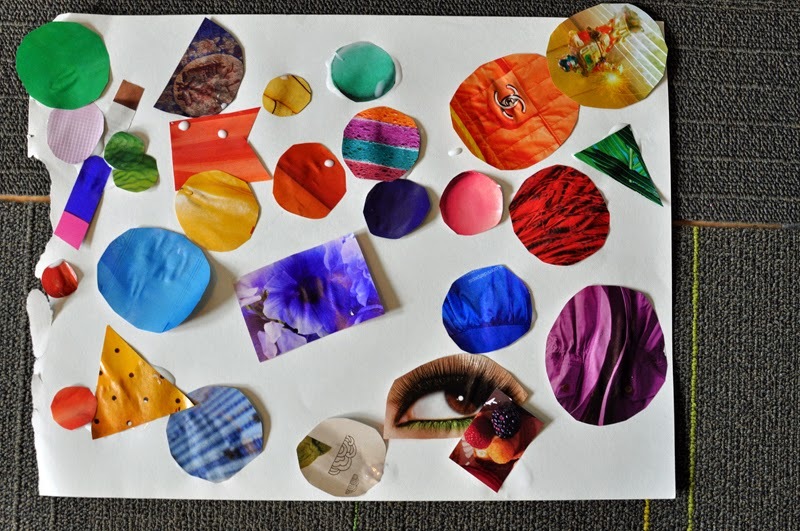 As she got more used to making collages, she began to request particular colors, sizes, and shapes. Her most frequently requested were yellow circles. As I flipped through the magazine, she would ask me to cut out certain items she liked – such as the eye. Her final collage used overlapping pieces with small areas cut out of the middle, this is at the top of this post. 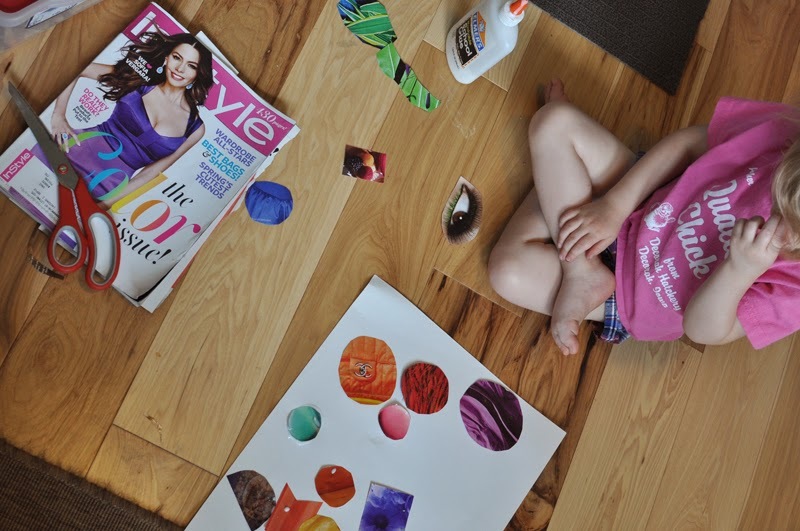 Greta has plastic scissors and we are working on her cutting technique, but in the meantime, this mommy daughter collage collaboration is a fun way to spend a morning. We spent part of our morning on Friday making yogurt pops. 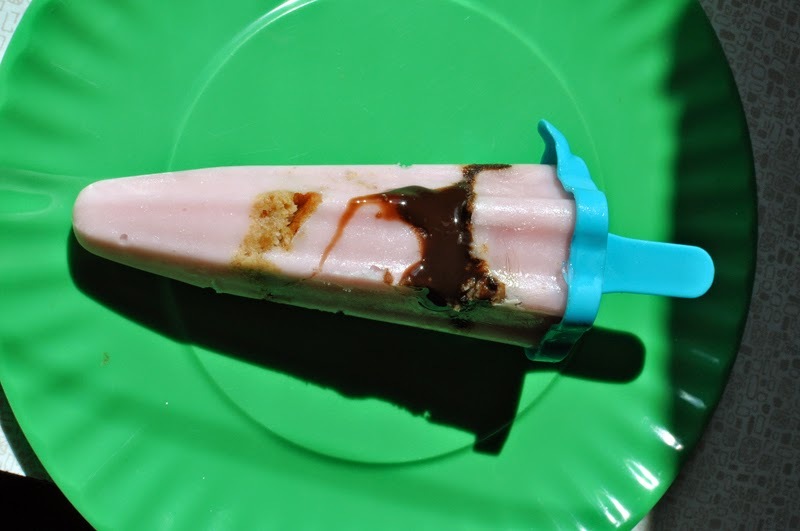 Greta helped me layer strawberry yogurt, crumbled graham crackers, and chocolate syrup to make these delicious freezer pops. Frozen desserts are a good way to practice patience for little kitchen helpers!